The Hubble Space Telescope has been observing nearby star Epsilon Eridani (10.5 light years away). The star is similar to the sun and is known to have a dust disk which was discovered in 1998. There is no dust closer than about 35 AU from the star, leading to the conclusion that planets have formed in this region and cleared it. 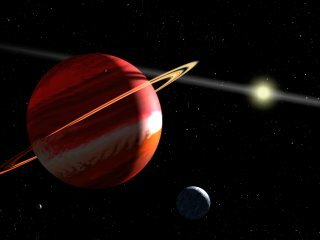 In 2000 a team of scientists announced a suspected planet the existence of which has finally been confirmed, after years of debate, by the Hubble observations. The planet, Epsilon Eridani b has a mass of 1.5 Jupiters and orbits at a distance of 3.3 AU from the star. Another planet Epsilon Eridani c has been postulated but not confirmed. The Hubble observation has now shown that planets form from dust disks. Something we all thought we knew, but apparently this is the first time a system has been known to discover both a dust disk and a confirmed planet! Interestingly, because Epsilon Eridani is so close the Hubble team think they may be able to see it when it makes its closet approach to its star in late 2007. Watch this space . .